When it comes to the exorbitant fuel prices in Central Australia it’s not about the bottom line but about the top line – namely the yellow one in the two graphs above. It shows what you are paying at the pump compared to the Terminal Gate Price (TGP, mauve line) and the Singapore Parity price (blue line). And the gap is what the dealers are pocketing. In the last three months that margin grew massively: the TGP dropped significantly but the dealers hardly adjusted their prices, so that the margin, per liter, is now around 40c. That’s around five times the average around Australia. And the graph above right shows the movements in the past 12 months: As the TGP rose so did the pump price. As the TGP dropped significantly in the last three months, the retailers kept their prices at the high point. The figures come from Edon Bell, General Manager of the Automobile Association of Northern Territory Inc. He and former Alice Springs alderman Murray Stewart have joined forces to stop the apparent rorting. Mr Stewart, who says he will “out” dealers overcharging customers (see comment below), is calling for legislation to put a limit on the profit margins. He says the ACCC should examine the issues, and the Town Council should also become involved. Mr Bell says: “When last the TGP was as low as it is today, in January 2011, we were paying 148 cent per liter, for close to a full year. The fuel industry in Alice Springs is tight-lipped. Mr Stewart says he’s been trying to call meetings but none of the players turn up. A major figure in the local industry, speaking to the Alice News on the condition of not being named, says the price dynamics are complex. The mark-up by the wholesalers is usually constant and does not affect changes in the the margin between the pump price and the TGP. That fluctuation is a factor of what the retailers are charging – and they can charge what they like. That the prices charged around town are usually the same could be a matter of interest to authorities responsible for preventing anti-competitive conduct, says Mr Stewart. Our source says if a trader would undercut the current – amazingly uniform – price “the others would follow suit with an hour” and a price war would be triggered. And who would win that? The national giants, Woolworths and Coles, of course, and the victims would be the mum and dad operators. As for the moment, the giants, the mums and the dads are all equally doing just fine. Says Geoff Trotter, of the Queensland based consultancy Fueltrac: “The motorists of the NT are being ripped off something terrible. “We’ve had the largest drop in the global oil price and the Australian wholesale price in 18 months. “It went down 15 cents a liter. “The retailers trousered 14 cents a liter. And what, it could be asked by residents in The Centre, is Minister for Central Australia Karl Hampton doing? That the government should intervene is being made clear in an ACCC report in 2007, saying in part that “the Northern Territory Government should focus on ensuring market forces operate as best they can” although “in the absence of any discernible evidence of market failure, there is not economic rationale for regulatory intervention”. He says there may be justifications for the margins to be greater here than the national average because the turnover is smaller and the overheads are likely to be bigger in Alice Springs, but the gaps should be nowhere near as big as that. Mr Bell and Mr Stewart agree on that. The price itself, of course, is bound to be higher because of freight – an estimated 15 cents per liter. Mr Bell and Mr Trotter disputed that figure and the News is attempting to get information from major haulage firms. Mr Trotter says 8c to 10c may be closer to the mark. In any case, Mr Bell and Mr Stewart say fuel had to be transported to Alice Springs before and after the drop in price, so transport cost has no relevance to the argument about the change in price. Mr Trotter says 25% of the freight cost is fuel, so freight cost should have come down, and freight companies buy their fuel at wholesale prices linked to the TGP. Mr Stewart says he asked NT Senator Nigel Scullion last Christmas to see if he could trigger a Senate enquiry, but he hasn’t heard from the Senator since. Australian Institute of Petroleum – national average weekly retail petrol prices for the 12 weeks to 24 June 2012 (note the sharp decrease in prices) and Alice Springs average weekly prices (note practically no decrease). I am frustrated with the fuel prices in Alice in particular the LPG fuel which appears to be the lower quality propane instead of butane gas, and sold at exorbitant prices. I have a Prado which I purchased as dual fuel and I have noticed in Alice there is little advantage to LPG. I was recently in Adelaide where the pump price was 52.8 cents a liter. Before discounts it cost me $34 to fill a 65 liter tank. 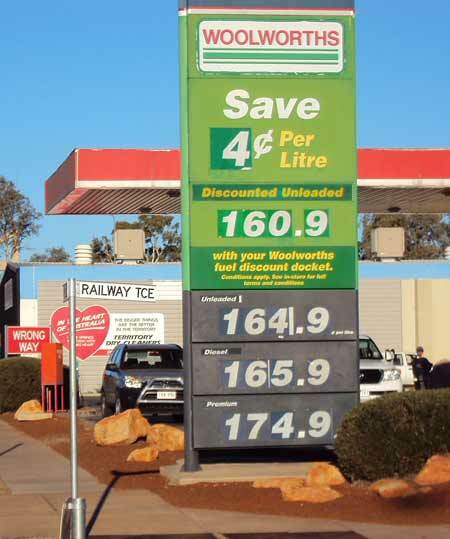 Here in Alice the pump price is $1.109. I put $50 in and got just over half a tank. We are paying more than double for an inferior product, 58 cents per liter extra. Someone is profiting big time. I have heard that fuel transport costs are closer to 2 cents a liter when you divide the cost buy the hundreds of thousands of liters you can fit on a triple semi. I have heard that the Granites get their tax free diesel delivered for about 50 cents a liter. More recently I heard that Pine Gap get there diesel delivered for about 70 cents a liter. Can we create a community petrol station where profits will directly benefit the community, and keep the other guys honest? Guys, you buyers / consumers have the ability to fix this. Being Alice it is simple just boycott one specific service station, either Wollies or Coles, until they bring the prices down. God help us. Somebody quick – get Coles and Woolies to obey. This is an emergency. If they don’t act, we will be forced to endure a tidal wave of righteous indignation from the human talk machine. The vulnerable will drown, and small children will be swept away. There must be a better way. PS: Could this be the first glimmer of an independent run for Braitling? Locals in the center will know that I have been beating the drum about the obvious fuel rip-off for some time. The fact that across the nation motorists are benefiting from an 18 month low in fuel prices, all except for us in the NT, brings my frustration up to a new high. My sincere word of warning to those who are currently profiteering from hard working Northern Territorians is this: Unless I see a significant shift downwards in fuel prices within a week, I will ask Territorians to join me in a very public campaign which will out those responsible. Yes, I do have a strategy in mind which hopefully I will not have to outline. My appeal to the industry is, give Territorians and our economy an even break.